Margaret Elizabeth Sloat died February, 24 in Chapala, at the age of 88. Sloat was born May 13, 1925 at Grey Nun Hospital in Regina, Saskatchewan. In 1929, the family moved to Hamilton, Ontario, where Sloat finished high school and began working as a dental assistant. She married Robert D. Sloat, an RCAF pilot, aeronautical engineer and home builder in 1947. Her husband’s final RCAF posting was North Bay, Ontario, where in 1970 Sloat began her stellar career as the city’s first female real estate sales person. Sloat eventually became president of the North Bay Real Estate Board and a director with the Canadian Real Estate Board. She was the owner of the area’s first Remax office, which she soon led to number one in sales in the city. Sloat moved to Lakeside in 1995. She was a prominent member of the Canadian Club, organizer and leader of many memorable bus tours throughout Mexico, props manager at Lakeside Little Theatre, and proud member of the Saint Andrew’s Church choir. Sloat travelled worldwide and said she never met a people or culture that she did not love and respect. She was a proud Canadian but had an attitude about Canada’s latitude that would lure her to Mexico for her last 19 years. Sloat adored life in Ajijic, and all the wonderful friends and acquaintances she was so grateful to know, love and socialize with. Her tremendous character, kindness, integrity, spirit and love of life will be missed by all who knew her well. Sloat is survived by her children, Robert, Holly, Peter, and John; and five grandchildren, Car, Dave, Samantha and Katie Sloat, and Zachary Nodwell. A service and reception in her memory will be held at St. Andrew’s Anglican church in Riberas de Pilar on Saturday, April 26, 2 p.m. 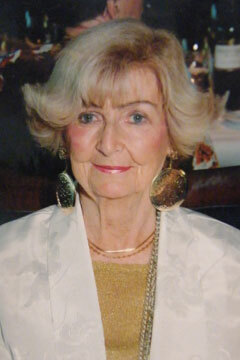 Eight-year lakeside resident Muriel Allsop died peacefully March 31 at the age of 91. Born in New York City on December 13, 1922, Allsop divided her early years between the United States and England. She became interested in dress making and design when she got her first peep at a fashion magazine. At the age of 18 she secured a job as a seamstress, and later as a dress designer at Florence Lustig Fashion Studios in New York. Since many of the clients were movie stars, she told fascinating stories of their off-camera personalities and antics. She once had to deliver a dress to Clark Gable’s hotel room and when the actor opened the door she nearly fainted. Lucille Ball occasionally would visit the design studio and would have the staff in “stitches” that sometimes put them a little behind schedule. In 1946, Allsop went back to England with her son from her first marriage to be with her parents and to follow her dream to travel. After five years in Liverpool, Allsop applied for a production manager’s position for an opening in Cape Town, South Africa. This job would combine her love for travel and clothing design. In 1951, Allsop and 11 other women moved to Cape Town to help with the start up of a women’s clothing company. Here Allsop pursued her love of motorcycles, which led her to meet her future husband, Eric Allsop, a fellow biker, originally from Amsterdam. After five years living under the oppressive apartheid regime, the family moved to Toronto, Canada. There she graduated from George Brown College and resumed her love for the clothing business during a career with the Hudson’s Bay Company. The glitter of Toronto started to fade in the early 1980s and Allsop and her husband retired to Picton, Ontario, where she discovered a passion for acting, writing poetry and gardening. In 1993 her husband passed away and after 13 years of country living on her own, Allsop finally decided to take up an open invitation to move to Mexico to be with the “kids” in 2006. Her perpetual smile, positive outlook, kindness and humor will be missed in the lives of those who knew her. Allsop is survived by her son, Chuck Pattinian, and daughter-in-law Carol Ann Fougere of Ajijic, granddaughter Melissa Vecchio (Mario), and great-granddaughter, Victoria of Toronto. The family thanks Delia Villanueva Zambrano, owner of Casa Nostra Nursing Home, and all the staff there for the loving care that Allsop received.